Wow, what a beautiful color combination of reds, pinks, purples, gold, and a real gold adventurine gold sparkle! The exterior is bold with an abundance of sparkle while the inside is a lovely more subdued nature. 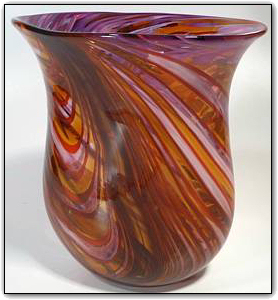 This perfectly formed vase would be an elegant addition to any room. Make sure to zoom in to see just how deep and vibrant the colors are and to see the gold sparkle... the more light you shine on it, the more it sparkles!